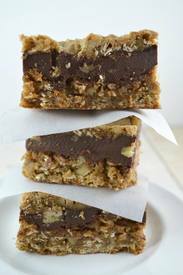 Chocolate oatmeal almost candy bars! Happy National Oatmeal Day! I don’t even know where to begin describing these cookie. “Holy Cow Batman!”, comes to mind. I have to tell you these really blew my mind. I guess I wasn’t sure about the combination. Weird huh. I mean what’s not to love? Dories original recipe had raisins in it along with peanuts. I guess that’s the part that wasn’t working for me. Well, my daughter and I just decided to omit the raisins and switch the nuts to walnuts and bake up a batch. These were so off the charts delicious. I couldn’t believe it. The recipe makes a large bunch but we went through it like it was a tiny amount. It was almost embarrassing. Well, anyway, if you haven’t tried these yet you are truly in for a very sweet treat! P.S. I tempered my chocolate for the chocolate layer, it made it more into a hard candy bar type treat!